This time I will discuss the various print surfaces I have used and my experiences with them. Your results may differ. How well do prints adhere to it? How easy is it to remove the print from the bed? Is it compatible with my differential IR height sensor? You won’t find anything about ABS printing here. The limited amount of ABS printing I have done has persuaded me that for health reasons, I should not print ABS until I have a heated and filtered enclosure for one of my printers. In any case, it’s impossible to print large ABS parts successfully without a heated enclosure because of warping. My first 3D printer kit came with a 3mm glass bed and a roll of Kapton tape, with instructions to apply the tape in strips to the bed. So my first experience of 3D printing was PLA on Kapton. I didn’t find it very satisfactory. I found the tape tricky to apply without having overlaps or significant gaps. The tape didn’t last for many prints before it got damaged and had to be patched up. Some PLA filaments did not adhere well enough to the tape. I am told that the easiest way to apply Kapton tape is to use wide rolls and put diluted washing up liquid on the bed support before applying the tape. Then the tape will slide over the bed. Use a credit card as a squeegee to remove excess water, and allow to dry. I haven’t tried this method. 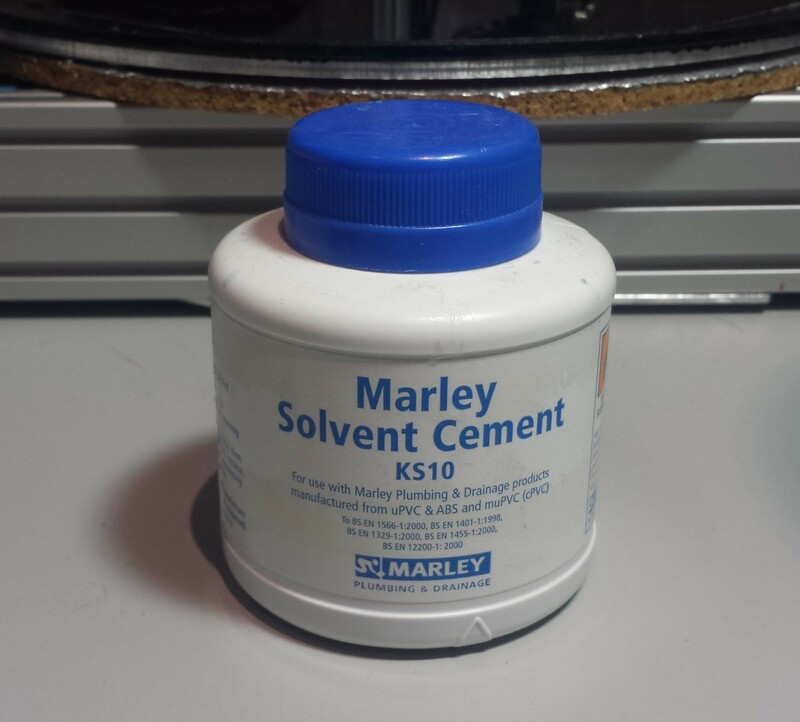 I started with a pot of Marley KS10 solvent pipe adhesive, applied to the glass surface using the applicator built-in to the lid. This provided excellent adhesion for PLA. I soon discovered that I could get a thinner layer and make the tub last longer by diluting the cement with several parts acetone. Later I changed to using dissolved fragments of ABS filament in acetone, although I found this a backward step because it gave a less uniform solution. The bed has to be painted with the goop before every print. This is quite quick, but you have to be careful not to spill it on anything that doesn’t like acetone, such as ABS parts of the printer. If using an IR probe, you need to coat the bed everywhere you will probe it, because it slightly affects the trigger height. Use a slow first layer speed, especially where there are sharp corners. Slic3r’s option to reduce speed for “small perimeters” is very useful here. Cost: €24.97 + €10 shipping including VAT for a 304mm diameter piece, or £58.61 for a pack of 3 from Amazon UK. Other sizes are available. Compatible with IR sensor: yes, using the original black version. I haven’t tried the white version. A thin, flexible material supplied in self-adhesive sheets with a speckled dark grey appearance (now also available in white). Does not need to be heated when printing PLA on it. Some users say it can be hard to remove the print from the BuildTak surface without damaging it. Cost: I have been quoted £38 for a 330mm disk. Square pieces cost less, e.g. £15 for 200mm square. Also needs a sheet of heat-resistant adhesive, e.g. 3M 8153LE adhesive at £12. A composite material about 0.8mm thick. Fairly rigid, but needs to be glued down to the bed support. So far I have only printed PLA on a sample I was sent. 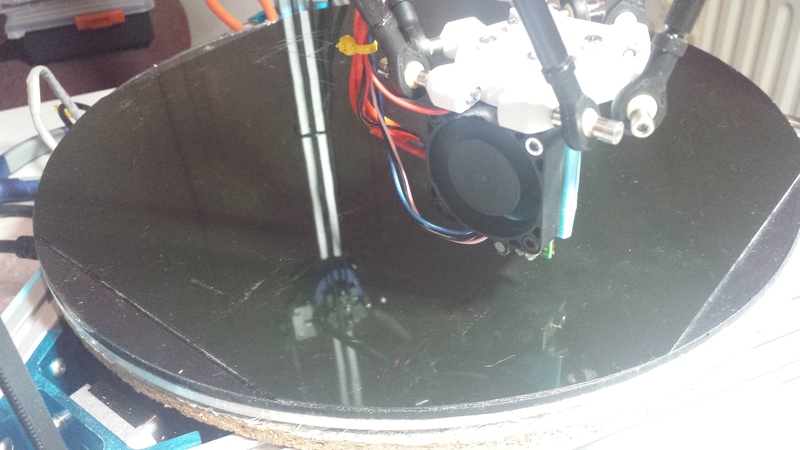 At about 60C bed temperature, adhesion was good, and the print came off easily when allowed to cool down. It’s opaque to IR, so it works well with the height sensor. PEI (trade name Ultem) is said to be the new wonder bed material for FDM printers. It’s quite expensive in the UK, for example a 305mm square sheet 0.8mm thick costs £39 here although that includes a sheet of 3M adhesive (unfortunately it doesn’t specify whether the adhesive is heat-resistant 8153LE or something else). I found it less expensive to import a similar sheet from amazon.com here for £16.83 and the adhesive sheet separately for £12 (see link above). Total cost £29, which makes it about the same price as BuildTak sheets purchased singly. 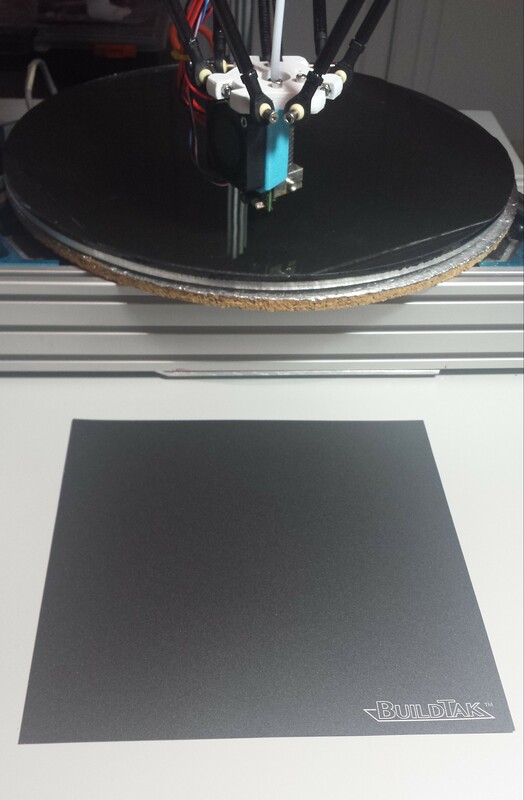 Unlike PrintBite, the 0.8mm PEI sheet can be cut with a good pair of scissors, so you can buy a square and cut a disk from it. One problem with PEI is that it is transparent to infrared light. This means that the surface below the PEI sheet affects the trigger height of the IR sensor. To avoid this, I sprayed the dull side of the PEI with the same matt black stove/barbecue paint that I used on the aluminium bed plate, and baked it in a domestic electric fan oven for two hours at 170C. The paint is then firmly bonded to the PEI and passes the sticky tape test. Then I used the adhesive to stick it paint side down on one of my glass bed plates. This allows me to remove the print and glass plate so that I can cool it down faster and release the print. I have achieved excellent results printing PLA on to PEI heated to about 65C, although it’s claimed that you can print PLA on cold PEI. A test print of PETG on PEI heated to 100C also went well. This list is by no means exhaustive. In particular, it doesn’t include masking tape (also known as blue tape), PVA glue stick on glass, or hairspray on glass. 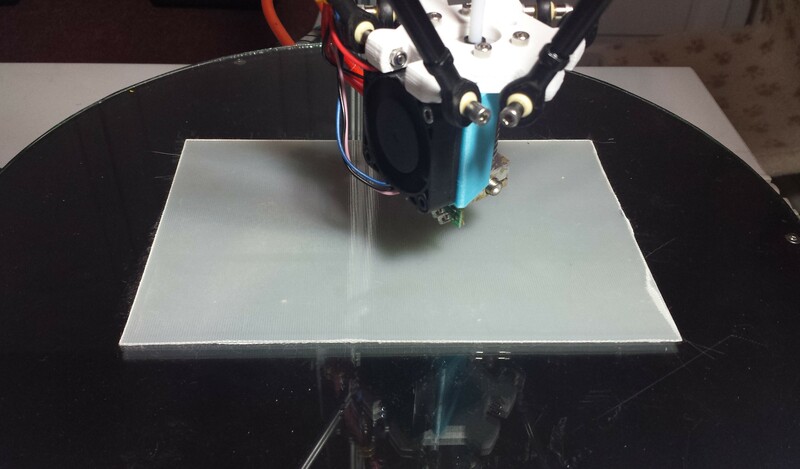 This entry was posted in 3D printing and tagged 3D printing, BuildTak, PEI, PrintBite. Bookmark the permalink. I find UHU stick works perfectly for PLA and ABS. Spread on the glass bed on my upgraded release 1Think3dPrint3d Mini Kossel to Duet 0.8.5 electronics and an E3DV6 hotend. And your firmware. I am getting brilliant prints. Forgot to say I use your I/R Z probe, and I use a black piece of paper between the heated aluminium bed and the glass plate. The same for me with UHU stick. But for big PLA prints (on a cold bed) I use PVA (Vinavil in Italy) glue in a 50-50% water solution. In addition, I add a single layer brim , 8-12mm wide around the object using Slic3r. In this manner, I have no curly edges at all. The first few prints after applying the glue, the object sticks so well that it is quite tricky to remove it from the bed. MakerToolWorks recommended that I use PVA glue mixed with 4 parts of water, brushed on to the bed for PLA. I usually print in ABS these days, on PEI, but for some reason, when I go back to printing PLA I get adhesion issues. Normally it’s the opposite right? Well; if I remember to put down PVA, I don’t get adhesion issues! I can even print without squashing the first layer, or with Slic3r’s generous 200% extrusion. Interesting! What bed temperature do you use when printing PLA? I was a fan of very clean, hot glass but as David says, some PLA’s just don’t stick. I’ve gone back to always having a layer of Pritt Power down, it usually lasts a few days before its too dry and needs replacing. So easy to clean as it just dissolves in water. This is also good if it comes away with the print, quick rinse under the tap and all gone. You can’t do that with ABS slurry easily. 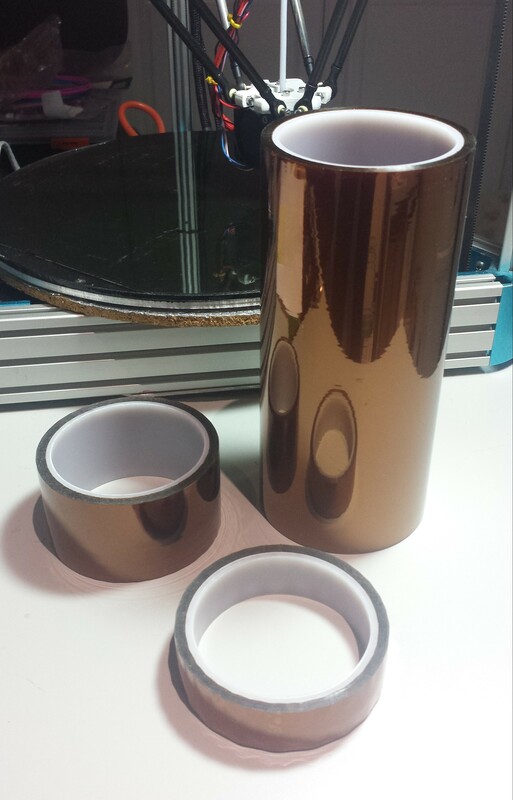 The trick to kapton is skipping the crappy rolls of thin stuff, and instead buying it as a single, thick sheet backed with adhesive. The thicker stuff doesn’t tear or separate from the bed surface like the thinner tapes do when removing parts. I’ve had excellent results with 0.005″ thick kapton–it leaves prints with a very attractive glossy bottom. For large or difficult prints, a quick wipe-down with 100% acetone or 70% IPA before printing prevents any separation issues. Full disclaimer–I only print ABS, so I’m unsure of PLA performance. No one tried polycarbonate (lexan or other brands) ? I use 3M Spray-Mount with PLA on glass and have great success with it. If you print with the bed around 40C it gets more ‘tacky’, but is almost dry to the touch when cool. You can get a nice thin coat on the bed, and don’t need to replace it every time, only when it gets scraped off. The downside is that overspray protection is recommended! Also, it doesn’t seem to work at all with ABS. AFAICT Kapton is only suitable for PLA (and maybe with ABS slurry for ABS prints). UHU glue stick (or any other PVA-based material) worked well when I used it months ago, but it requires intense care and I found it difficult to get a level surface once a few parts had been printed. PEI worked very nicely on my setup, but some materials tend to damage its surface badly because they fuse together too well (SoftPLA for example). BuildTak seems to work even a bit better – I can confirm it does the trick at least with PLA, ABS and TPU, and I get virtually no warping even when printing big objects. I have purchased some PrintBite, Do you suggest sticking it directly on my aluminium plate or on my glass plate above? If I stick it on the glass plate I can easily remove the plate but if I stick it on the aluminium plate I am going to have to come up with a way to attach the plate without using the screw and standoffs. My own preference would be to use a glass plate with the PrintBite stuck on top. That way, if the print sticks too well, you can remove the plate and put it in the fridge or freezer to help it. It will also cool down faster if you remove it from the bed plate. It also makes it easier for you to try other print surfaces, or replace the PrintBite if you ever need to. Just found these blogs and interested as I’m thinking of making my mini Kossel larger with some of your mods. FYI, I have recently changed to using 3DLAC, after using Kapton for a couple of years. I must say the results are stunning, very strong grip when bed is hot, then print just snaps off when bed gets cold. I only print with ABS, so not sure how it would work with PLA. 3D Prima BT10X10 BuildTak Print Surface, 254 mm x 254 mm – £12.23 on amazon for 1 sheet. Very simple to install, on either base plate or glass. but it is superb and well worth the first layer wait for how fast you can go after a solid base. I’m using a heated bed, even though not many instructions mention this. Very easy to remove the prints and no mess. With this and a print fan I am getting regular fast and detailed prints even at 0.3mm layer height with a 0.4mm nozzle on my ‘Midi’ version of DC’s ‘Large Delta’. BuildTak works equally well for PLA without a heated bed. I’m using a flex3d which is a 3mm PC sheet, some people has bought lexan’s to same effect. As a bed it works wonders, everything sticks to it with a cold bed, PLA, PET, ASA, TPU, only have used heat on nylon, at 50º, haven’t tried ABS because of the fumes. Since it bends is easy to remove the prints right after its finished. My only concern is the IR Probe, I’m using yours and it works beautifully on my glass bed, but on the PC’s one there is no way to calibrate it, any ideas? My guess is that your PC sheet is transparent to IR. Painting the underside matt black as I do with PEI may be a solution, if it doesn’t come with the adhesive sheet already attached. I read somewhere in a discussion thread that UHU stic would be a good material to fix the prints on the bed. So I looked in my office box and found an old UHU stic, that really worked well. After the stic was empty I bought a new one in a shop, but for what ever reason the same product didn’t work any more suddenly. Whatever I did, i could not get the new UHU stic working for me, so I had a problem. Perhaps the manufacturer changed the recipe ? In a forum I read the tip to use cheap wood glue mixed with a little water as a bed coating. Hoever that didn’t work eihter, though the wood glue was water solvent. Then I tried powder sugar as a glue, but that again didnt work. Finally when I was desperate because I could not finish my prints, I tried to mix the powder sugar with the rest of the wood glue. And believe it or not, that worked perfectly. This mixture of Powder sugar with wood glue on my 112 ° C hot print bed was so successful that I sometimes had difficulties to remove the prints from the bed. Add droplets of water until you have a viscosity similiar to salad oil. The glue may be easily re-activated if too dry by spotting onto it with a moist sponge – even if the print bed is already hot. See http://bechele.de/pages/english/152-0.html for the wood glue I use.